It wasn’t like anything I had imagined. Nothing I had seen on television came close to what actually occurred. Nothing could have prepared us for the truth, except the truth. Nothing could have altered the outcome. Don’t get me wrong, thousands of people handed out their “predictions”. It was as if everyone had suddenly become a soothsayer. Depending on your philosophical, political or physical point of view the predictions had different outcomes. Some thought it would be the Biblical “Rapture”, others thought the Human Race would be obliterated (why just human kind and not the rest of animal life I don’t know), the Earth would rotate on her axis, Zombies would be created and pro-create with biting people, earthquakes and hurricanes would demolish everything and everybody, and still others said nothing would happen. The Mayan Day-keepers viewed the date as a “rebirth”. The start of the World of the Fifth Sun. A new era as the solar meridian crosses the galactic equator and the Earth aligns itself with the center of the galaxy. They were all wrong, and yet they were all eerily right. December 21, 2012 came as every other day had during December. People shopped, celebrated the holiday season, made plans for the New Year’s celebrations, shoveled their driveways, collected paperwork to file their income tax returns, in general people went on living. Then evening fell. And so did the radiation flare. 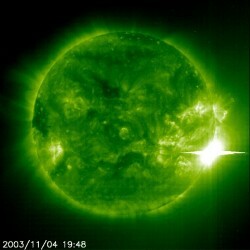 I have since learned that it takes eight minutes for the radiation of a solar flare, from the sun, to reach the Earth. Typically, this has happened on a daily basis for time on end. Earth was born within radiation showers…we were not. 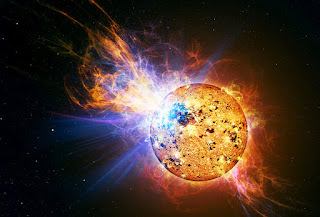 We had all experienced the problems of the Suns eleven year cycle, called the ‘solar maximum”. The amount of solar flares interfered with our; cell phones, internet, i-pads, and all types of navigational gadgets. Slow downs, lock ups, dropped connections were just a part of everyday life during 2012. We, the laymen, did understand sun cycles. Most of us knew this would pass and uninterrupted life would resume. The debacle on September 11, 2001, of the Emergency Broadcast System, was repeated. It seemed this time for different reasons. Not for lack of attention. Many eyes had been watching the skies. The minions were not warned because the underlying funds to keep the system in place had been funneled into some pet project of a certain senator. No one was manning the air waves. For hundreds of years, every year, there was some cult leader predicting the end of times. Every culture spoke of it in their history/legacy/legend and myths. From the; Mayans, Hopi, Edgar Casey, Bible, Torah, Koran, or Nostradamus, they had all predicted the fall of human kind through fire and water. I think this may have been episode #1....thank you Ms. Sandra. I appreciate you taking the time to read my stories. I am hoping the new beginning on the 22nd of December is the awakening of all humanity in a new light. One where only peace and love exist. Conflict is no more and hate does not survive. The new earth of the 5th sun might just be a more peaceful and loving world. Thanks Jo - may have to incorporate that into a third!! Peace...how would the politicians justify themselves!? tee hee. Thank you for taking the time to read my little stories. You are so kind. I hate all the predictions of doom and gloom that so many people and churches feed themselves into a frenzy about. If the end of the world comes, it will come. There will be nothing any of us can do about it, so why worry about it? I guess that is my motto, to just enjoy life the best I can. I wish everyone in the world would just get along and be happy in their lives. I'm always surprised at how much energy and attention people give to end of the world predictions. If we all focused on today as if it was the last, just imagine the wonderful changes that would happen! I too have been amazed by the coverage of this particular date. As for awakening or enlightenment....we, the sheep of the world, have seldom been allowed to be "awakened" as there is always a political or profitable reason to keep the minions in "the dark". We shall see....thank you so much for taking the time to read and respond to my story.